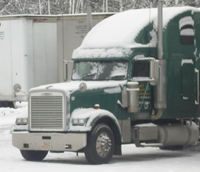 KelTrans Freight Watch: Are your shipments ready for winter? Are your shipments ready for winter? Do you move liquid based products? If so, now is the time to start planning for the season ahead. KelTrans has selected a specialized carrier base who are ready and equipped to handle these shipments for you. Starting the beginning of November, KelTrans' carriers are offering protect from freezing services. These are services available until April. Providing predictable protection from freezing temperatures in the Northeast means providing a complete protection package for products that travel under potentially extreme conditions. Our carries offering range from thermal blankets, heated line haul trailers, heated terminals, special dock training, and temperature-sensitive load planning to to ensure your shipment is protected throughout it's journey. All of this ensures that you can ship and/or receive water-based products regardless of the temperature. If you haven't already made plans for the upcoming winter, call your KelTrans freight representative who can provide more details about this freeze protection service. This is extremely helpful info!!! Especially since you guys are offering it for free!! Very good listing. Everything is true. Thanks.